Alright so another week has passed by and the Fall series have begun picking up the pace as they approach the end of the series. This week I’ll be sharing my thoughts on Samurai Flamenco episode 15, Kill la Kill episode 16, Golden Time episode 16, and Nagi no Asukara episode 17. It’s been quite a ride watching Samurai Flamenco. 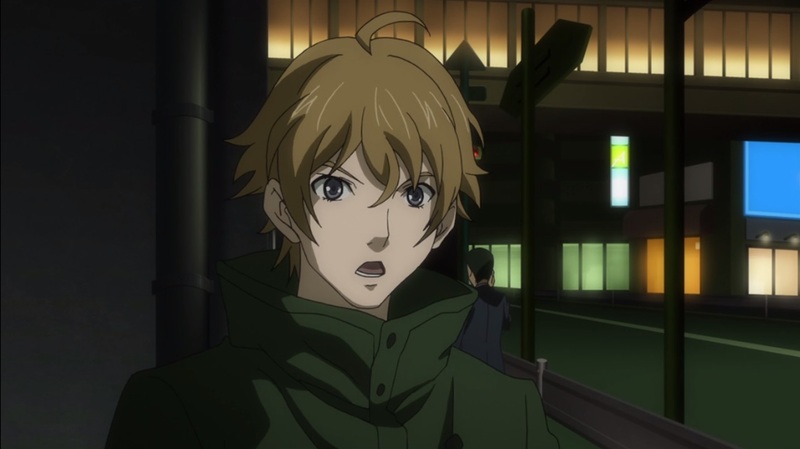 At first I really enjoyed the realism and how optimistic Masayoshi’s character was. While the sudden plot twist with From Beyond was a little offsetting for me, I didn’t mind it too much. That is until it kind of dragged on for too long and kind of made me lose interest. However, the grand scheme of things has finally been revealed, the entire From Beyond act was just a government conspiracy. I kind of had a hunch that something along those lines would be the case but to be honest, I was questioning myself after 5-6 episodes went by and things just got more silly. In the end, I thought that the purpose of the entire From Beyond act was meaningful but poorly executed. We can see how easily united people are once there is a common threat (which is applicable to real life and the wars) which was exploited. The media was able to easily manipulate the population by attracting so much attention to the enemies and then quickly villainize the same people that were “protecting” them. I would have preferred if they didn’t drag on the whole From Beyond arc by following the cliche of having a new villain appear, and then having good prevail for several episodes in a row. While I’m sure the director had good intentions with it, I feel that the general consensus is that many of us just flat out lost interest and connections with the characters and story. With that said though, I’m glad that we’ve finally cleared up the whole invasion of aliens and can now go back to what Samurai Flamenco originally was about. This was probably one of my favourite episode of the series despite there not actually being any real “action”. However, the truth behind the life fibers is finally revealed, that they’re aliens who feed on humans but allowed us to develop mentally. We also find out what COVERS, which was mentioned by Ragyo earlier on, is and how it relates to REVOCS. It seems a little odd, seeing the Kiryuins being nothing more than spokesmen and the ones doing the dirty work for COVERS. 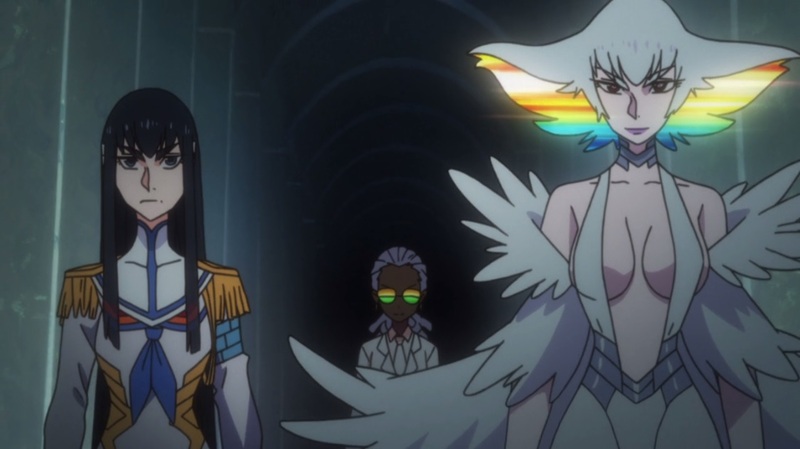 Satsuki struck me as the type of character who sits at the top of the hierarchy alone and leads through her sheer abilities. Instead, she’s nothing more than a mere pawn to COVERS and Ragyo. Basically life fibers are going to destroy/take over humanity which means that Satsuki and Ragyo’s empire will be meaningless. 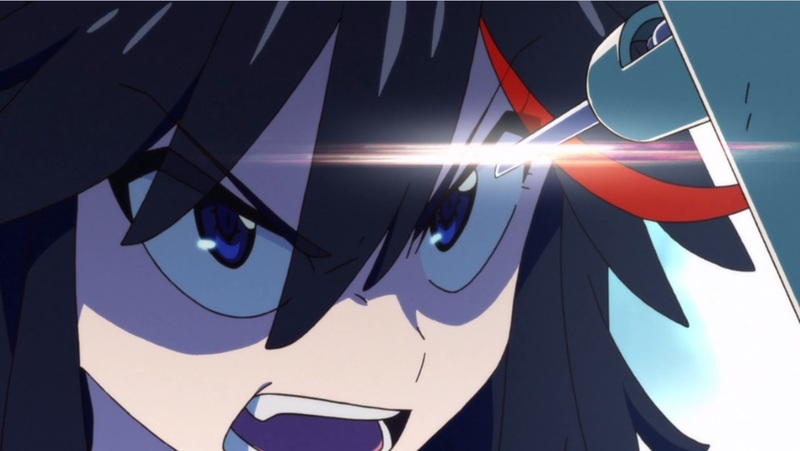 Ryuuko on the other hand took a different approach after hearing the truth. While humanity is at risk, she realizes that destroying these life fibers would be the same as destroying Senketsu. She’s been able to co-exist and develop a deep friendship with Senketsu despite him technically being an enemy. Perhaps Ryuuko will be the one who is able to bring peace between the life fibers and humanity and allow them to mutually exist together. It’s a miracle that Banri was able to prevent anymore damage being done after Kouko fell asleep on the wheel. 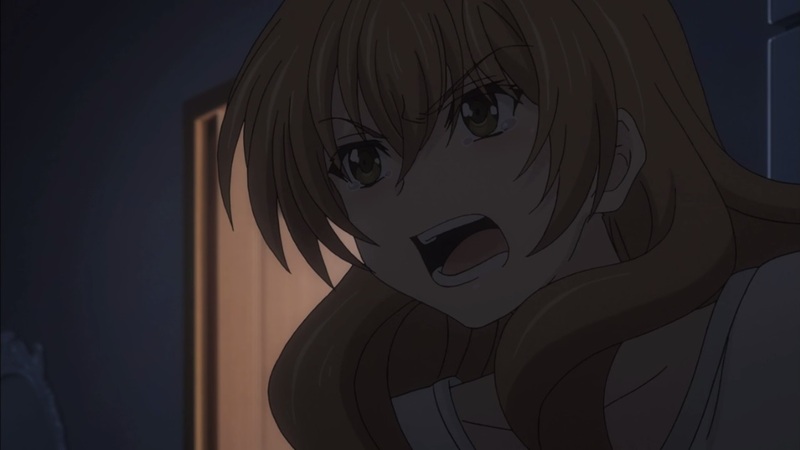 While I’ll admit I was a little bit annoyed with Kouko’s obsessive and generally crazy character, this episode did have me feeling some sympathy for her. She’s been pretty much alone all of her life aside from Mitsuo who eventually wanted to get away from her. She finally has someone else she can rely on but is afraid of losing him too (especially since his memories could return at any point). Her upbringing didn’t really help with her social life as well, being a beautiful rich girl resulted in her being isolated from her peers and made her lack general social skills. As a result, she’s incredibly insecure which leads to her crazy behaviour and freaking out about Banri over a dream. I’m glad that we didn’t dwell on a depressed Kouko for several episodes but rather they decided to resolve the issue within the episode. This was another somewhat relaxing episode with the return of Kaname. We get to see how the characters adapt and embrace “change”. 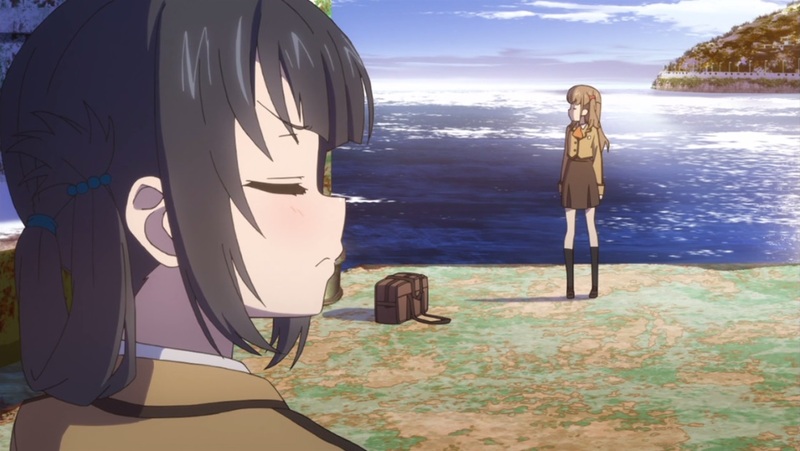 A lot of the show has been focusing on Miuna and Sayu since the time skip and I personally like to see how their views vary despite being best friends. Sayu seems to look at things from a more realistic approach, life isn’t a fairytale where everything goes according to plan. Whereas Miuna is the complete opposite who believes in things like fate and destiny and wishes to continue pursuing Hikari. Sayu was afraid of approaching her first love after time apart in case she’s changed too much and he doesn’t recognize her at all, or the fact that he’s changed too much and she no longer feels the same way as she did in the past. Miuna on the other hand was itching to see Hikari and approach him right away as if nothing had changed. With Kaname’s awakening, we get to see how he reacts to all the changes that went on while they were hibernating. His feelings for Chisaki haven’t changed and he’s upfront about it still. However, you could feel his uneasiness watching Chisaki and Tsumugu being together. Even though they aren’t dating, the two seem to understand each other perfectly and just seem to naturally fit together. Regardless, Kaname decides to put the issue aside for now as there are more important things, like rediscovering Shioshishio, to attend to. 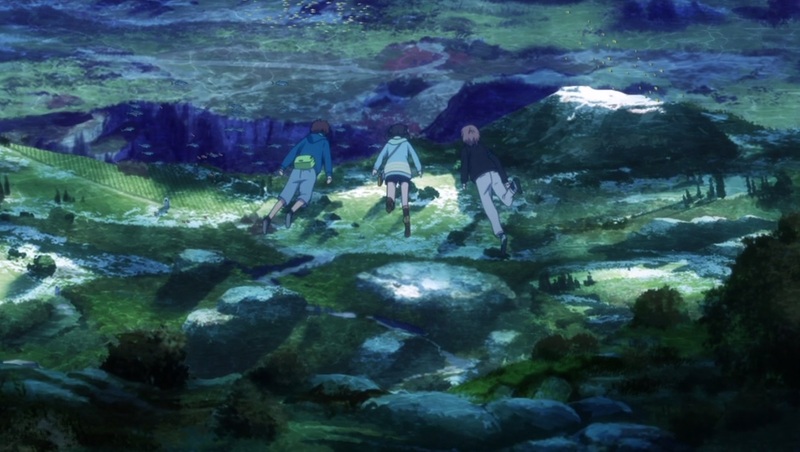 Well that wraps up another week of Fall 2013 anime for me. I’ve been a bit preoccupied with school and other things and as a result I haven’t been able to focus as much time on anime or the site as I wanted to. However, I do plan on posting additional content in the future in addition to my weekly thoughts so stay tuned for that!